The fennel plant, scientific name Foeniculum vulgare, is a species within genus Foeniculum. It is treated by most botanists as the sole species in the genus. Fennel is a member of the formerly named Umbelliferae family, which is currently known as the carrot family Apiaceae, containing plants such as Dill, Baltic Parsley, and . Fennel is a highly flavorful and aromatic herb that has numerous medical and culinary uses; and it is one of the main ingredients of absinthe. There are primarily two major types of fennel: the Florence fennel, known for its green leaves and the Bronze fennel that develops beautifully deep colored foliage. The Florence fennel has different variants that have been bred for their yield, superior taste, and resistance to bolting. The Montebianco or Mantevano has large white crunchy bulbs, while the Amigo F1 or Victoria has good resistance to bolting. 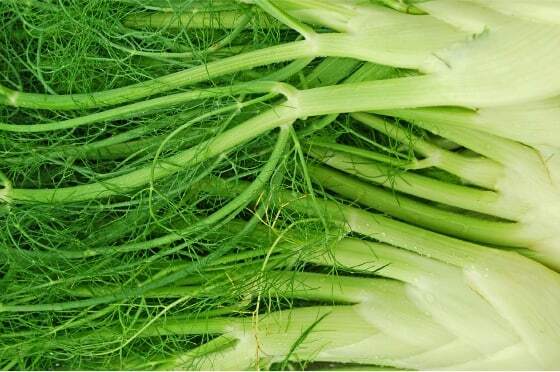 Florence fennel that is grown for its bulbous stalk needs at least 90 to 115 days that are frost-free to reach harvest. Sow fennel in mid to late summer for harvest of autumn crops. Choose a spot that has a well-drained soil rich in organic matter. Grow fennel in full sun and prepare the planting bed ahead of time with the use of aged compost. The soil should be a little acidic with a pH of 5.5 to 6.8. Although fennel grows in most soils, it is best to grow in richer soils as this will produce more foliage. 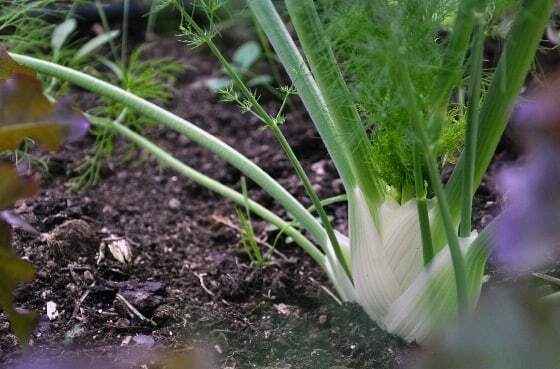 Fennel is a cool-weather season perennial that is grown as an annual, this means that fennels can be planted in the garden as early as two to three weeks prior to the average last frost date in spring. The germination of seeds is at its best at 60°F (15°C). The plant can tolerate both cold and heat but grows best when it comes to its maturity in cool weather. Fennels are best grown from seed. Sow the seeds ¼ inch (6 mm) deep, at about four to six inches (10 – 15 cm) apart. Directly sow the seeds as soon as the ground can be worked, and thin fennel seedlings to about 10 to 12 inches (25 – 30 cm), with rows 18 to 24 inches (45 – 60 cm) apart. Avoid planting the seeds near tomatoes, Dill, French/Bush beans, or caraway plants. It is best to stake plants in areas that are windy, as they can be blown over. Always keep the soil well moisturized and organically rich. This can be done by spraying ample amounts of water (but be careful not to drown the plant or seeds) and adding organic compost at least twice a month. Mulching can promote soil moisture especially in hot regions. The best companion plants are members of the mint family. Blanching the lower stems once the bulbous base has grown to a size of an egg can produce sweeter and tender bulbs. This can be done by mulching up around the bulb. Gently remove the stalks of seeds to increase the production of bulbs and stems. Fennels normally self-seed when left unattended and can cross-pollinate with Dill. Fennels can also be grown in a container. A single plant can grow in a six-inch (15 cm) pot, for bigger plant variants use eight inch (20 cm) centre containers. 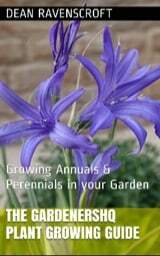 Plant in fall /autumn if you want the plant to reach maturity in cool seasons. Fennels can be attacked by pests such as the parsley caterpillar. Remove this by hand – avoid spraying harmful insecticides as this can damage the Fennel plant itself. There are generally no other serious pest or disease problems. Once the bulbous stalk of the plant reaches three inches (8 cm) or more in diameter, it is ready for harvest. Just like when growing celery, cut the whole stalk below the point where the stalks are joined together. When the leaves have reached 18 inches (45 cm) in length, cut them once or as needed. Florence fennel can be harvested 90 to 115 days after sowing. Fennel can be eaten fresh and can also be stored in the refrigerator for a week, and can survive two to three months storage in cold moist places. Its stalks can be dried or frozen, and the fennel leaves can be fried or frozen as herbs. Dried leaves are best kept in a clean airtight container.